It was my 5th day of blue-water diving over the last 3 weeks for pelagic jellyfish in Southern California, and my 2nd charter I was bringing out to experience the jellies. Dropping down our line, at about 70ft the water was getting clear. The ocean floor was 1,000ft below us. Wow, we really hit the jackpot. A giant 15ft purple jellyfish, with an entire squadron of fish being sheltered, started to swim by. Although we normally stay tethered to an anchor line, we swam into the blue-water for a brief encounter with this majestic beast. This was definitely one of the highlights of my diving career! 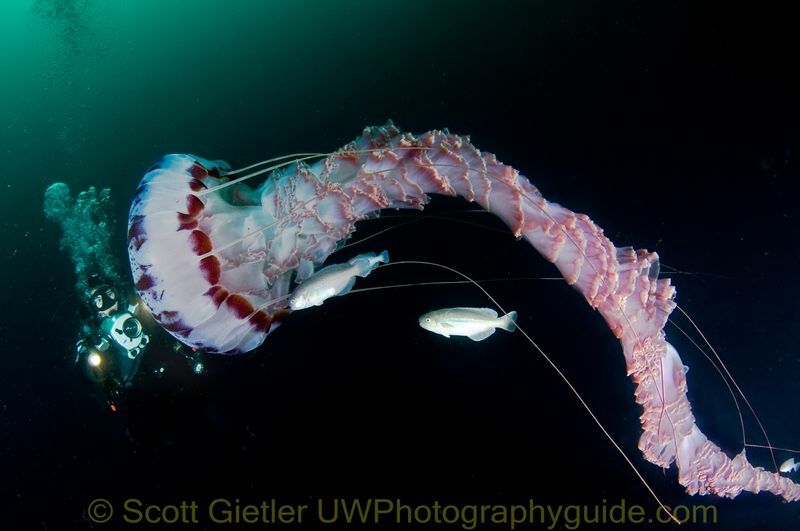 Chrysaora colorata, the purple-striped jelly, with Medusa Fish, Icichthys lockingtoni. 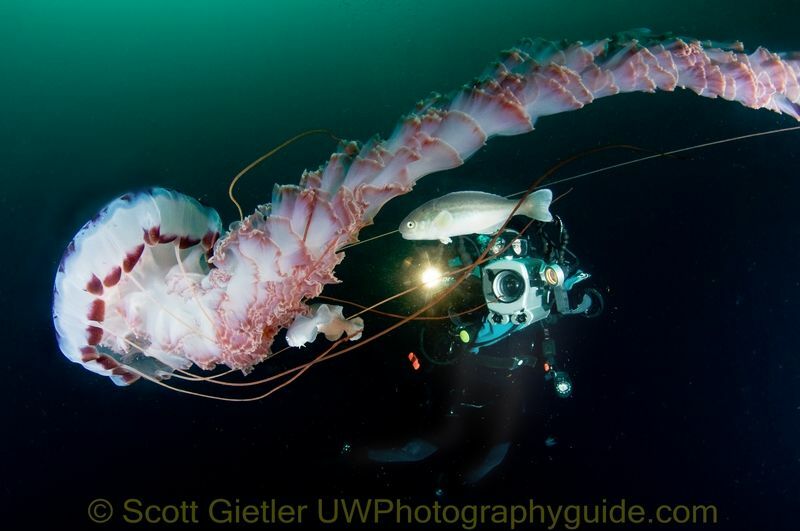 What an incredibly beautiful jelly! This jelly has a powerful sting, but we were well covered. I have more underwater photos of this jellyfish that I'll get up later. Later in the dive, and on other dives (we did 3 blue-water dives total) we saw hundreds of 12-inch orange jellyfish, comb jellies, a couple more extremely rare juvenile ragfish under jellies, many salps, pelagic gastropods, and a giant siphonophore that was at least 60ft long! Maybe even up to 100ft long. It just kept going on and on and on, out of the range of visibility. Stay tuned for more photos from the group. Here's a link to the underwater video that Anastasia was taking while I took these photos. Submitted by Joris on Thu, 2010-08-19 13:49. Wow, that's really cool! Great pictures. Submitted by Anonymous on Tue, 2010-06-08 10:27. Submitted by Kevin G on Wed, 2010-05-12 14:07. Submitted by Anonymous on Mon, 2010-04-26 20:59. Submitted by Anonymous on Mon, 2010-04-26 13:50. Submitted by Anonymous on Mon, 2010-04-26 13:43. Submitted by Anonymous on Mon, 2010-04-26 12:39.